Not spending the night celebrating the new year in a wild party had its advantages, mainly that it was easy to get up early to go to the airport with Nat. In the taxi, the driver told us that there had been a terrorist attack in a night club in Turkey. Bad news to start the year, and I wondered what 2017 had in store for us. The airport was very quiet and Nat got through check in and security fast. As soon as she disappeared past the gate I started to feel the usual emptiness that takes over every time I go on alone. This time was different, as I still had company, but for the first time after some years we had decided to buy intercoms to make the long distances more bearable, and we had got used to it very quickly – I was sure the long moments of silence on the bike ahead were going to feel harder. 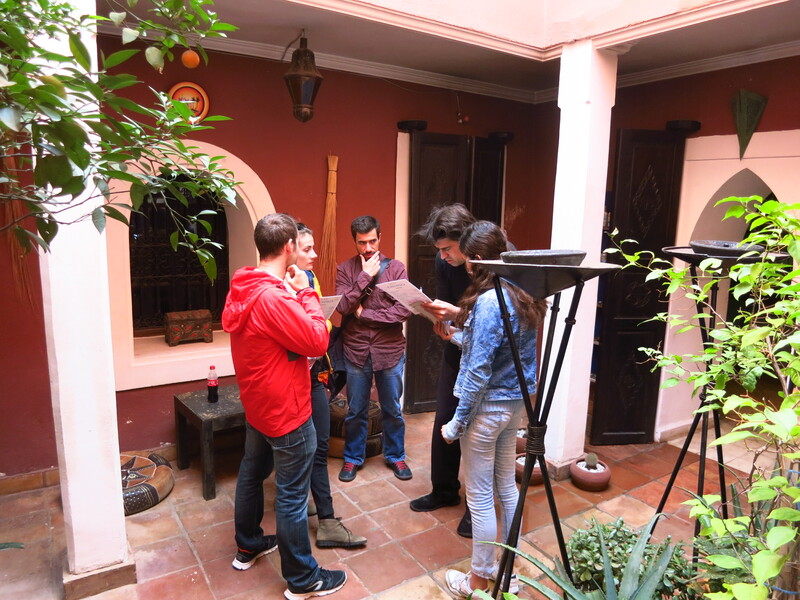 I meet the guys in the hotel lobby and Gerard, Esteve and I went out to check a riad we had found nearby while Raluca finished packing. It was supposed to be only a couple of streets away from where we were so that moving all our stuff would be easy and we would avoid parking the bikes somewhere else, but weirdly enough, we got different locations for it. The maps on Booking.com and Maps.me placed it two corners to the east of our riad, heading further into the old town, while Google Maps indicated that it was in the exact opposite direction, near the square where we had parked the bikes. We checked the first location but could not find any place with the name we had booked, Riad Jakoura. 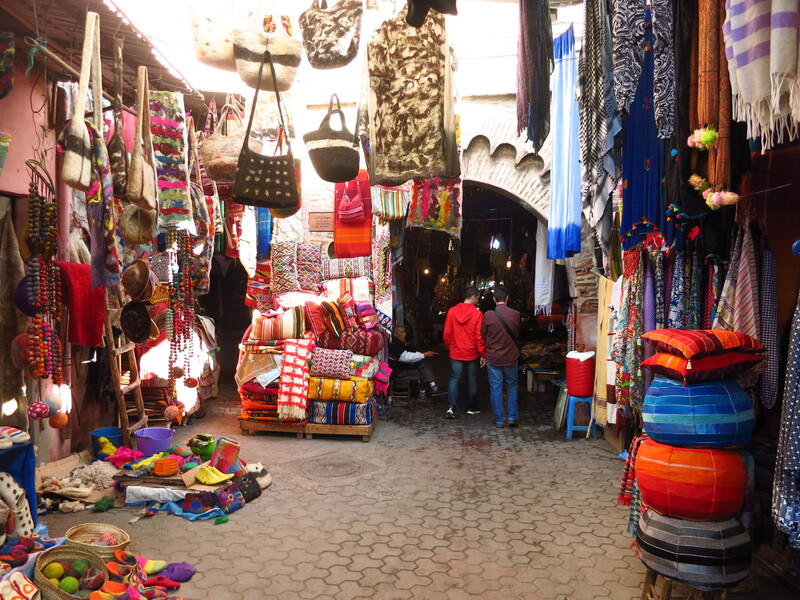 We asked the locals, went round and round the given location checking every alley in the medina maze, but could not find it. We even asked in another riad nearby, but they had not heard about it. We tried to call the number on the reservation to ask where they were, but nobody answered. When it became clear that the location was wrong, we decided to check the other one. This time we had a street name and a number, but when we got there we only found a restaurant that was also announced as riad. The guy there had not heard about a Riad Jakoura, but when he asked us to show him the pictures in Booking.com to see if he recognised the place, we saw that there was a watermark that read Riad Calypso. That one he recognised, and pointed us to a place that was in neither of the locations we had. In the end, we found a small wooden door with the name Calypso on a small sign hanging above it. We knocked several times and after a good while a guy dressed in scruffy dark clothes and with messy dark hair opened the door and gave us a confused look. Two things were immediately clear – one, he was not Moroccan, although we could not tell where he might be from, and two, he was monumentally hungover. It took a while to make him understand that we had a reservation there, and once he got it he made us go in and sat behind his desk in a tiny windowless office. He hunched over a laptop that was missing several keys, his face lit by the orange glow coming from an electrical heater next to the laptop, only a few centimetres away from his head, and started clicking away, mumbling to himself, narrowing his eyes and asking me to spell my name several times while he talked to a young girl standing next to him in the semidarkness of the room and who, we deduced, was a new hire he was training. Esteve and Gerard were waiting just outside the office, and while I was not having much luck making the guy understand what type of rooms we had booked, Gerard was having much better luck at something altogether different. Right at that moment, standing in the tiny hallway of the riad, he felt ‘the call of Africa’ after six straight days of not going to the toilet, and not wanting to waste the opportunity, he snuck into a toilet he found behind a small door under the stairs and made peace with the world. By the time he came out, Mr. Hangover had finally found our booking and was ready to show us our rooms. Esteve’s and mine was on the ground floor, in the courtyard, and Gerard and Ralu got one in the first floor, but not the one he originally intended, it seemed – when he opened the door to show Gerard his room he found a guest sleeping. Apparently he had forgot that the room was taken, and after apologising profusely he took Gerard to the right one. We let him go back into his dungeon to nurse his hangover by the heater and went to get our staff from the other riad, but not before an unsuspecting Esteve walked into the toilet for a quick piss and ended up almost needing medical attention after finding the aftermath of Gerard’s ‘call of Africa’. We also had to pay the guys in the square for another night of parking, and when we had done so and checked that the bikes were OK, one of them started asking something in Arabic that I did not understand at first. He was pointing at Gerard’s bike and then at me, and I gathered that he was asking me if it was my bike. I said it was not, and pointed at Gerard. Then the guy produced a bunch of keys from under his djellaba and dangled them in front of him laughing. Gerard had left the keys on the bike the day before! When we went past the bike with the panniers on our way to the other riad, the guy was still laughing. While Gerard and Ralu finished taking their stuff into their room I started chatting with our host. I was curious to find out where he was from, as he spoke French fluently but with an English accent, but when I heard him apologise to the guy he had accidentally woken up in English I could not pin his accent. It turned out that he was a writer and poet from Seattle, where he had lived until he was 21. He then moved to Paris until his mid-thirties, and then to Greece, where he had had a girlfriend. After they split up, he lived in different places along the Mediterranean coast of Spain until his latest novel, called The Wanderess, became a success. Apparently, he had made quite a lot of money out of it and of ‘selling some of his poetry to a pop star’, as he put it, and had thought it was time to make an investment in his future, so he had decided to buy a riad in Marrakech. He had been running it for only 10 months, which explained the change of name (but not the location problems). We spent the day in the intoxicating chaos of the medina, buying some souvenirs and enjoying the atmosphere. After so many days of long hours on the bikes it felt great to spend a day on foot just relaxing. 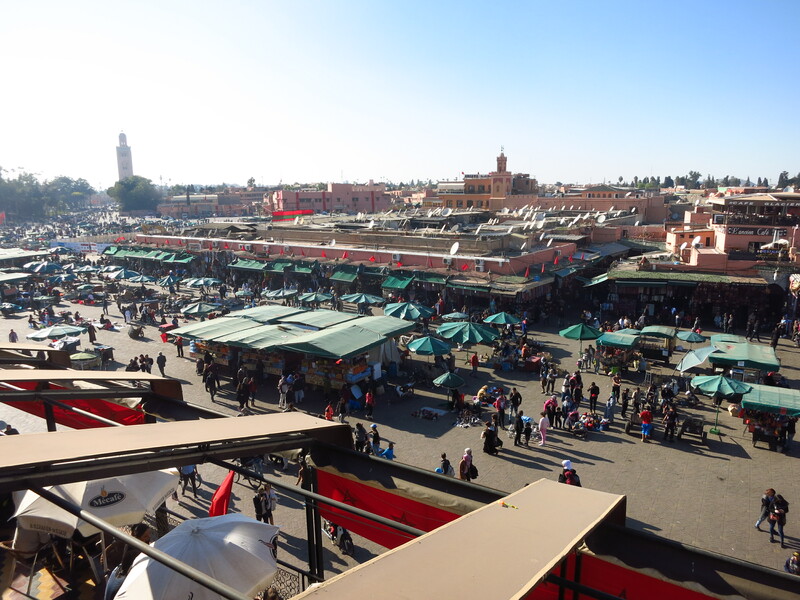 We had a kebab in the Jemaa el-Fna square, a coffee and a goffre in one of the roof terraces overlooking the square and headed back to our riad to see the sunset on the rooftop. 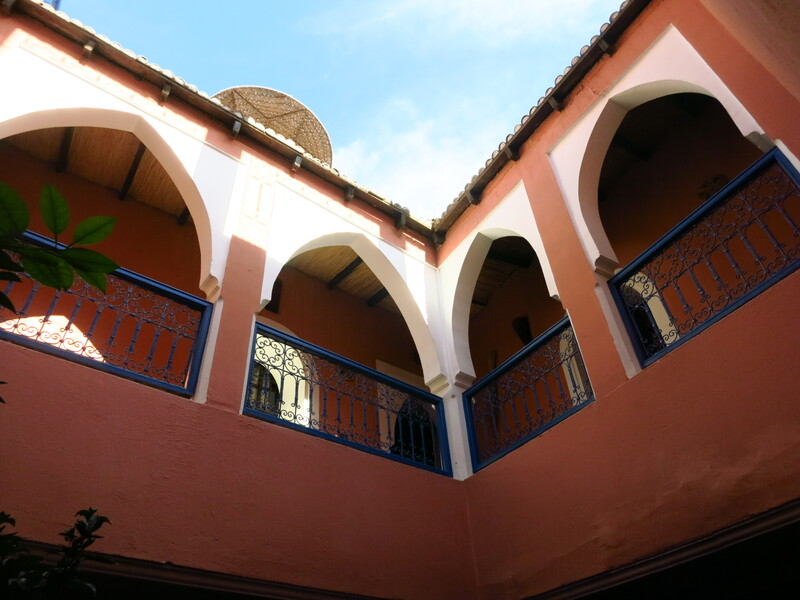 Having seen the state in which we had found our host in the morning, we were pretty sure that this time we would finally be able to get some beer to enjoy on the terrace, and we were not wrong – the riad had some Moroccan beer that tasted like heaven after so many days of abstinence. The brief description of the riad owner, mr. Payne, does not do his life justice. Check out his biography here. This entry was posted in Moroccan Christmas 2016, Travel and tagged Honda CRF 1000L, Marrakech, medina, Morocco by Kilian. Bookmark the permalink.